ternational Energy Agency (IEA) wants to strengthen its work supporting the energy transformation to a safe and sustainable low-carbon energy system. A key asset of the IEA is its global network of over 6,000 energy technology researchers and experts working in the 39 Technology Collaboration Programmes, TCPs, (former Implementation Agreements) on a broad range of energy subjects. "We are on the verge of a new era of energy system transformation and innovation", said Alicia Mignone, Chair of IEA Committee on Energy Research and Technology (CERT) during a stakeholder meeting in September 2015 to celebrate the 40th anniversary of the TCPs. "We need to take full opportunity of these amazing instruments that are the IEA TCPs to ensure that the IEA remains at the forefront of global energy technology analysis." The Solar Heating and Cooling Programme (IEA SHC) is one of the 10 renewable TCPs. There are TCPs as well in the field of Fusion Power, Fossil Fuels and Energy End-Use Technologies (see attached pdf with a full list of TCP topics). 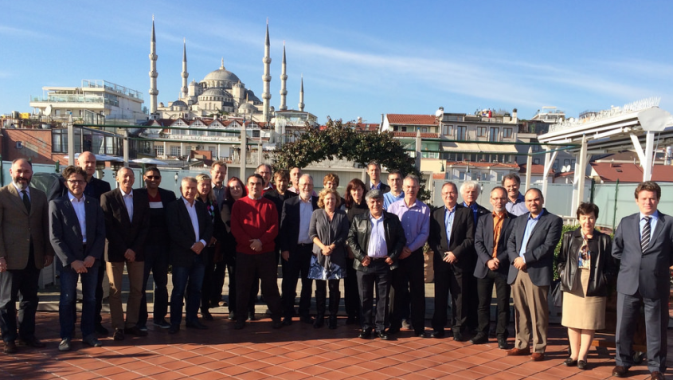 The photo shows the Executive Committee of IEA SHC during is meeting in December 2015 in Istanbul. The Executive Committee (ExCo) consists of representatives from each of the 25 participating countries and sponsor organisations and meets twice a year in a member country. The ExCo members discuss the management and results from current Tasks (projects), approve new Tasks and allocate national research budgets for the Task work. Find the list of ExCo members online. Every two years, the ExCo elects a chair among the country representatives. The chair represents the IEA SHC at conferences and IEA events and coordinates the ExCo meetings and other management issues together with the Secretariat, which is based in the USA. A research programme for a specific topic like solar cooling or industrial process heat is called a Task. Each Task is approved by the ExCo and receives a number and a title. A Task usually runs for 3 to 4 years and can be extended if needed. The last Task to be approved was Task 57 and is titled Standards and Certification. A Task’s work is organised into subtasks and Task meetings are held twice a year for the nationally funded experts to meet and discuss their work and present results. The list of current and completed Tasks can be found online. The manager of a Task is called an Operating Agent. He or she is responsible for reporting to the Executive Committee twice a year and for the timely delivery of all the promised results and a final management report. Each Task has a subpage on www.iea-shc.org that includes the contact information of the Operating Agent and the experts and offers news and publications for download. The results of the research work are called Deliverables. This could include the development of a calculation tool, a case study of a demonstration plant, a database of a specific technology, a report about suitable policy instruments or a 2-page fact sheet. All deliverables are publicly available for download on the Task´s webpage. The results from the various TCPs are used in IEA publications. High value is given to the distribution of the results and so a variety of methods are used from webinars, workshops and conferences to commercially published books, newsletters, press releases and articles in journals and magazines. In 2015, the IEA SHC Programme launched a partnership with solarthermalworld.org as a way to increase awareness of its valuable results and achievements. Solarthermalworld.org regularly publishes news about new Tasks, important results and new members, and all the news is posted on a dedicated subpage.